Green Mountain Grills vs Traeger Grills - What is the Best Grill? →Green Mountain Grills vs Traeger Grills – What is the Best Grill? Green Mountain Grills vs Traeger Grills – What is the Best Grill? Green Mountain Grills vs Traeger, now the question is what is the best grill? Green Mountain grills or Traeger grills? Food that you smoke over wood pellet fire is apparently one of the most flavorful tastes you can ever obtain from your backyard. With this in mind, we have two conflicting and competing alternatives you might consider for comparison. Whether to choose Green Mountain Grills or Traeger as your ultimate alternative, you are just on the right track. However, there are considerable differences of you should expect as far as the two pellet smokers are concerned. And this is what should influence your choice in the long run. This, more-so, holds true when you are thoroughly informed about the two smokers. For this very reason, we have decided to come up with this updated comparison. Hopefully, what seems similar and confusing between two smokers shall no longer be dilemma to you. First, you need some basic information about the brands and how promising and trusted they are. Then you can now go through how basic elements of these smokers differ from each other. Still, this is not sufficient. When you finally learn about who is best suited for which smoker, you’ll be set to go. Because you will definitely know which pellet smoker is the most suitable for you. Our adventurous trail in the path of BBQ has eventually led us to closely examine the features of Green Mountain Grills. We have discovered that this is a 2-rack chicken and 2-rack ribs capacity grill. Most notably, this grill is Wi-Fi enabled which makes it a really modern smoker with optimization in performance. Additionally, this smoker is a smaller-sized appliance which apparently makes it a convenient alternative for you. Most lovers of this smoker have embraced its potential for great performance as a result of the thermal sensing system. With this in mind, the resulting BBQ is always perfect with awesome taste. In terms of heating, this smoker ranks highly and very few smokers can actually enter into a competition with it. When we talk of Traeger, there is need for you to understand this brand in two perspectives. That there is that old version of and latest version of Traeger. This is a company which has undergone significant changes since its inception. As such, the old version of Traeger pellets grills was known to be a hard-built and awesome, which everyone would dream of. But nowadays, the brand is increasingly becoming worrisome, which calls for improvements. Although it is not the best grill available on the market, Traeger is conspicuously a flavorful pellet smoker. That is what previous users have acknowledged. With its 418 sq. inches capacity, it is even better for relatively large-sized families. While on our long adventurous trail looking for a better pellet smoker, these are the features we focused on: General design, size, temperature level, temperature regulation, price, portability and mobility, level of technology used, and general performance among other aspects. However, in this Traeger vs Green Mountain comparison, we have combined related aspects into one and looked at the two smokers from a wholesome perspective. So how does Green Mountain Grills Differ from Traeger? In terms of general structural design, Green Mountain Grills is built to last. It features a sturdy construction that is able to withstand pressure when using it. On the other hand, Traeger, as we have already noted, is not the original version of Traeger we knew at first. At least, the original version of Traeger was closely comparative to Green Mountain Grills. However, these days, Traeger is weaker compared to Green Mountain Grills when we prioritize general design. Nevertheless, if your priorities are short term service and other aspects like size, well, it’s not too bad a smoker. 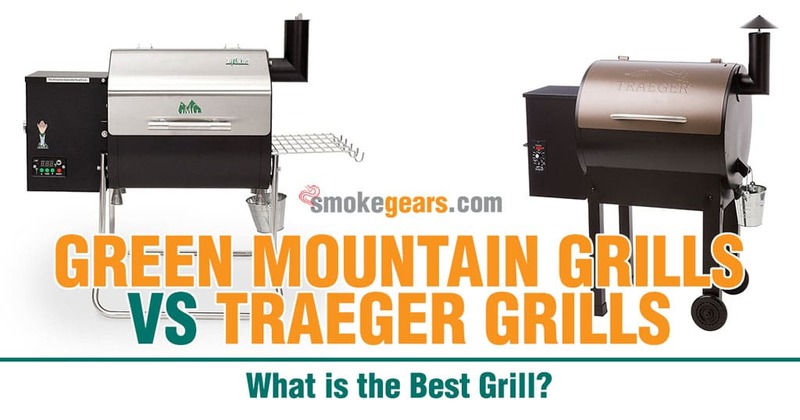 Overall, Green Mountain Grills is more long-lasting, sturdy and stable compared to Traeger. Green Grills is comparatively a small-sized grill, suitable for relatively smaller families. At most, its capacity is able to accommodate 2 racks of chicken and two racks of ribs. It weighs approximately 57.3 pounds and measures 32.1 x 16.5 x 20.9 inches. Enthusiasts of smoking and beginners have praised this smoker mostly because of its level of convenience. On the other side of debate, Traeger is a large-enough smoker for bigger families. It is able to accommodate 5 racks of ribs. Alternatively, if you are smoking chicken and ribs, you can comfortably fit in 2 chicken and 3 ribs. Its capacity of 418 sq. inches and dimensions of 42 x 22 x 49 inches is what makes it preferable. In terms of portability and ease of transportation, Green Mountain Grills obviously takes the lead. Needless to say, its small size and convenient design makes it easy to take it anywhere you wish. For Traeger, it would require three of so individuals to carry it on to move it from one position to another. Again, if you are using your Green Mountain Grills in your backyard it’s good that it remains there most of the time. This is because translocation can be a hectic experience, though it has wheels. Worst of all, it is easier to damage your Traeger grill during movement. But Green Mountain Grills can easily move from one point to another-because it is light-weight and features a sturdy construction. Further, what makes Green Mountain Grills more portable is its strength. As a result of this, you’re not worried of damaging your smoker. But with Green Mountain Grills, you have to be extremely cautious. Between the two smokers, the performance of Green Mountain Grills is outstanding and impressive. Notably, what gives Green Mountain Grills an advantage is the thermal sensing system which ensures that your BBQ does not burn up. Although Traeger does not give the best we can promise, it promises a nicer flavor than its Green Mountain Grills Counterpart. In spite of this capability, you just have to be present and careful to obtain that great flavor. Green Mountain Grills is Wi-Fi enabled while Traeger is not. This feature increases user-convenience since you can easily grill using your iOS and Android app. For the Traeger, this is one aspect in which it lags behind because it lacks such Wi-Fi enhancement. Rationally concluding, Green Mountain Grills is more innovative compared to Traeger. If you have ever used both types of pellet smokers, you would have to invest quite amount of time contrasting them. When you get to the market, you wouldn’t expect a huge difference in the prices of these two smokers. However, this is not what applies in the actual sense. Traeger is far much ahead of Green Mountain Grills. Looking at it critically, we know that the former has invested in the size of the smoker and the quality of BBQ. But Green Mountain Grills’ desire has always been that of bringing customers to a point of total convenience. With this, we don’t mean that Traeger is doing completely nothing. It’s just that Green Mountain Grills is working to top in terms of innovation. Traeger’s priority is nothing but a smoker that can grill large quantities, and grill it perfectly. That is why Traeger should adjust their price to cover their costs. So Traeger is more expensive compared to Green Mountain Grills. Nevertheless, if you purchase any of them from Amazon, the price is quite convenient and friendly. In fact, for you the buyer, it’s simply a great source of discount and a perfect bargain. Both being pellet smokers, we expect similarity in the grilling mechanism of the two smokers. Green Mountain Grills as well as Traeger pellets have a hopper in which the wood pellets are fed to perform the barbeque. In this manner, they both take relatively the same amount of time to smoke and grill food. Again, using either of them efficiently requires the same level of expertise and skill mastery. As such, learning to use Green Mountain Grills also enables you to use Traeger. The difference is minute. Both of the two are versatile. Although the degree of versatility is not exactly the same, what Traeger can do is what Green Mountain Grills can do. They can both smoke, grill, bake braise, roast and barbeque food. What varies is the amount, not the type of food that both smokers can prepare. Therefore, you should not consider your regular type of food the basis of judging the two smokers. Mobility and portability go hand in hand. However, they are such two distinct elements. Although both pellet smokers differ in terms of portability, their level of mobility is nevertheless similar. They both have wheels which optimize their movement, making both of them easy to move from place to place. In our attempt to analyze differences and similarities between these two smokers, we considered this a similarity. Safety refers to aspects such as product warranty and other quality aspects such as listings and approvals. To a considerable extent, reviews and ratings may also act as elements of safety. Back on Traeger and Green Mountain Grills, Traeger comes with 3 years warranty. For Green Mountain Grills, there is a warranty of one year. So one may argue that 3-year warranty period makes Traeger much a safer product. But one year is either not a short period of time. If you bought your smoker with defects arising from its manufacture, would you not realize it in the first year? Or even six months or even three? Looking at it from a different perspective, both smokers are awesomely reviewed, despite their differences. Similarly, previous consumers have positively acknowledged their service, but with regards to different features. This has led to a high rating for both smokers. Who is best suited to use Green Mountain Grills? Green Mountain Grills is best suited for consumers with small-sized families because of their relatively small size. Similarly, because they are portable, regular travelers and those going for camping can find satisfaction using this smoker. In the same way, if you are looking for a smoker that increases convenience because of more digital features, Green Mountain Grills still takes the lead. You can read more about the prospective users of Green Mountain Grills here. Who is best suited to use Traeger? What is conspicuous about Traeger is the big size feature and the ability to give out extraordinary flavor. Therefore, if you are a restaurant owner or your family is large-sized, this is a satisfactory smoker for you. Also, you’d better plan to purchase this equipment if you know your grilling position is permanent. Because of its relatively involving cost, it is good to plan in advance. On a light note, we classify it a smoker for people with a stable income. Nevertheless, as a beginner, nothing prevents you from using this smoker if you have what it takes to purchase it. You can read more about the most suitable users of Traeger here. Final Verdict: Traeger vs Green Mountain Which Pellet Smoker is Better? At this point, Green Mountain Grills vs Traeger, the decision to purchase either of the smokers still comes to you. If you’ve once owned any of the smokers, you know that emotional attachment that develops overtime. However, for the purposes of clarity, we conclude that Traeger is good but Green Mountain Grills is far much better. Definitely, if you were to make a sound decision, all factors being constant, we would advocate for the one with outstanding performance. And that is Green Mountain Grills. In the features we have analyzed, Green Mountain Grills tops in most of them. It takes the lead in terms of general design, portability, general functionality and grill performance. Most importantly, it is more cost-effective as far as price is concerned. Traeger pellets only tops in terms of size and flavor. In fact, BBQ flavor is almost the same in both, only that Traeger pellet grills is a slightly better. So the additional cost you will have to pay for Traeger doesn’t offer additional difference you expect. Now that you have a clearer direction to navigate, you can comfortably go for Green Mountain Grills without wasting much time in a dilemma.